I’m not exactly sure the definition of a “foodie”, but I’ve been called one from time to time. Before I had a child, my husband and I were out to eat at least 3-4 times a week. We live in what has been described by the likes of Food and Wine, the New York Times, Travel and Leisure and many others as a “foodie” town, up there with San Francisco, New York and New Orleans. So with so many great choices and with much lower prices than our metropolitan foodie rivals, it’s easy to find yourself out to dinner every night. That is until you have a baby. In the early months, it’s actually pretty easy to go out. Your baby sleeps most of the time and can easily be stashed in their car seat under the table or on the seat next to you. Best to pick noisy or outdoor restaurants in case they wake up and make a scene. If they do, a breast or bottle will probably do the trick and then you’re back to sipping your cocktail (slowly if you are nursing). Even once they are up longer, they are still easy to bring out with you. If Maddie was fresh off a nap, she’d be happy as a clam to hang out in the Ergo at the bar or sit on daddy’s lap and play with his spoon for an hour or so while we ate dinner. We took her to all types of places, even higher end spots like five-fifty-five, Emilitsa, Petit Jacqueline, and Miyake. Then she went mobile! Once the crawling started, it became much tougher to contain her – she wanted to move. Sitting quietly on our laps was a thing of the past, and high chairs became absolutely necessary. So now, many of our favorites, particularly the high end stuff, was out. And while friends told us to bring a portable high chair that can clip on to tables, I figured that if they didn’t have high chairs it’s because they didn’t want toddlers in their restaurants. And since I don’t want to be banned for life, I’ve refrained from bringing my own high chair to these places. 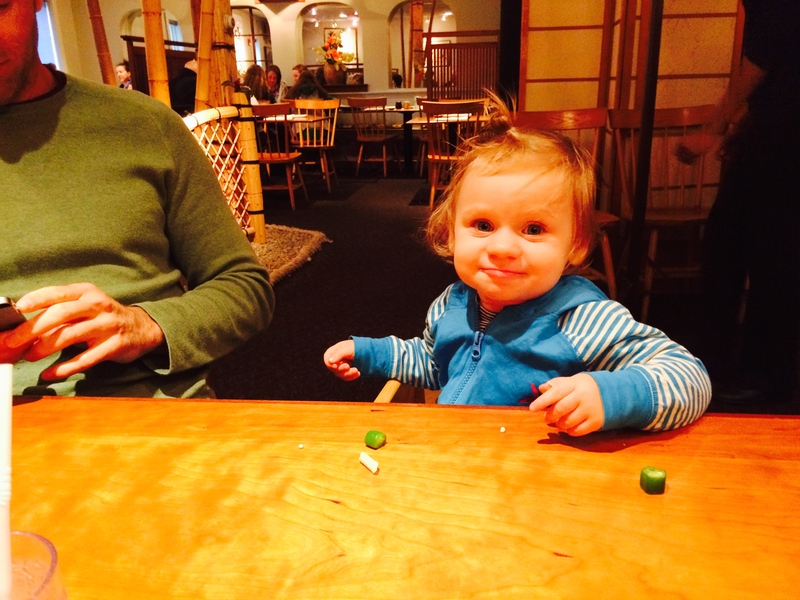 Then she started walking and wasn’t content sitting in her high chair playing with a spoon for a couple hours. Now she needed to be entertained or she would try to wriggle herself out of the chair, which she has successfully done several times. Once she started picking up and eating food, we’d make it her dinner time too, which works until she’s full and starts throwing her food on the floor or better yet, flinging it across the room at another table. Even if she doesn’t have a tantrum, she doesn’t have a volume control and so we tend to stick to the noisy spots now too. So now that you have a walking, talking toddler on your hands, what are the new top 10 rules of dining. 1. Obviously, only go to places with high chairs. Without one, just prepare yourself for prying silverware, food, plates, glasses, menus, napkins, salt shakers…etc…out of your little one’s claws and wrestiing a wild animal to keep them from crawling under your neighbor’s table. 2. Eat early! Get to the restaurant at 5pm on the dot, or even 4:30pm if they are open for an early happy hour. You’ll be dining with the happy hour crowd, the blue hairs, and other families just like you. Get in line early so you can get a high chair! 3. Eat quick! You have about an hour tops until your kiddo will start protesting the high chair. Get as much time walking around and letting them climb up and down the banquet as you can before the food comes. Then hopefully they are tired and hungry and will able to be still for a few minutes so you can eat. But no three course dinner for you, or even two sometimes. Tell the waiter to bring it as it comes and get the hell out of there before someone starts to melt. 4. Bring food you know they like. Even though last time they loved the rice and vegetable side dish, this time they’ll hate it and you’ll be stuck with nothing for them to eat. No food = cranky and/or bored which = wiggling and whining. 5. Bring toys and books. Toddlers (at least mine) is not going to play with a spoon all night. If they have to be in a high chair, they need to be entertained. And they aren’t going to play with the same toy or read the same book over and over for an hour. Bring several. 6. Buy your neighbors a drink, that way they’ll be less likely to try to get you kicked out if a piece of pasta ends up in said drink. 7. Tip well! That waiter is going to have to clean up after your mess and your tab will likely be less than their toddler-less tables. Give them the full 20% if not 25%. That way next time they’ll be happy to get your child another straw for the 5th time. 8. Bring lots of wipes. High chairs are rarely cleaned and tables are wiped down with a cloth that’s been sitting in a bucket of bleach water all day. For those of you who’ve waited tables before, you know. So bring whatever you feel comfortable using to wipe down the high chair and the table area your babe will be eating off of. You’ll also need those wipes for hands, spills, drool, snot and if you’re not so lucky, other more messy body fluids. 9. Have a drink – immediately. You’ll be less self-conscious and more relaxed about the whole thing. Most people hardly notice that your kid is sticking rice up their nose and then throwing it over their shoulder. Again buy your neighbors a drink just in case they do notice and get hit by one of the snot covered grains. 10. Repeat often. Get your kid used to going out. It may not always go as planned, but you can’t let having a kid keep you from being the foodie you were and still are. If going out to eat is a hobby of yours, then try to make it your kiddo’s hobby too. Now for those local folks. 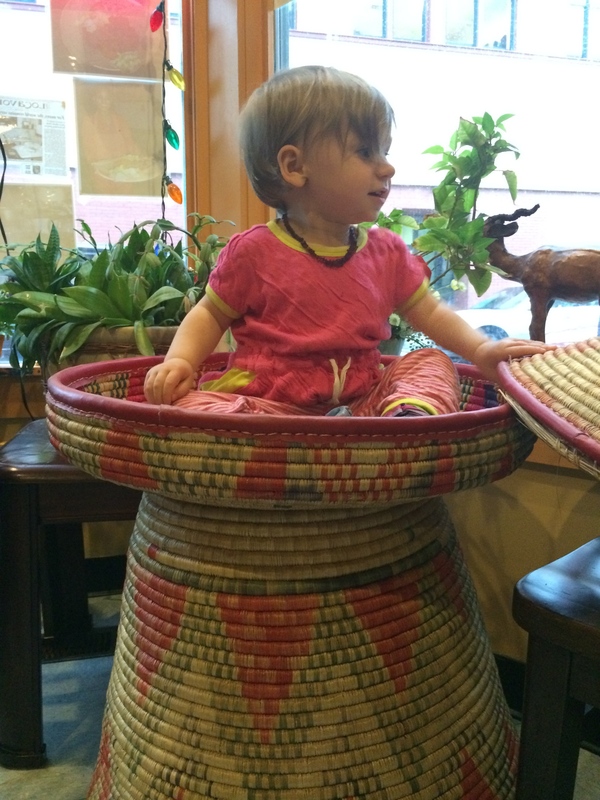 I’m going to keep adding to this post as I find restaurants with high chairs in the Greater Portland area. Please add any I’ve missed as a comment and I’ll add to the list. And I’m sticking with locally owned, non-fast food places for this list. I’m sure Burger King has high chairs, but what they serve there is NOT real food. Restaurants are in Portland unless otherwise listed. We like Portland Lobster Company in the summertime. Perhaps a bit cliche for us locals, but so nice to drink a beer outside and listen to live music. Toddlers are great dancers!